Who are your favorite movie monsters? The next Showcase Top Ten will be deep in October, gang, so we decided to get all Halloweeny-on your butts. Tell us your favorite movie monsters! You’re voting for the monster, not the movie. If you say “I’m voting for Freddy Krueger in Nightmares 1, 3, 4, and 7, but not 2, 5, and 6,” I’m going to stop reading and just chalk up a single vote for Fred. Similarly, don’t vote for the same monster twice on one list. (I know that seems like common sense, but you would be surprised at a couple of the lists I’ve gotten for previous episodes…) You can count two members of the same species or line as two different monsters, though. Okay, gang. Get your top ten list in early! Send ’em to Showcase@cxpulp.com! Blake and Kenny sit down this week to give their thoughts on the DC Animated film Superman Vs. the Elite! The guys talk about the movie, the comics that spawned it, and discuss DC’s next film, Batman: The Dark Knight Returns Part One. Plus, a special bonus for the ladies out there — the heavy, sensual breathing of Kenny “The Fan Guy” Fanguy. (Sorry to everyone else, we’ll try to make sure those microphones are a more respectable distance from our noses next time.) In the picks, Blake takes Batman #0. Contact us with comments, suggestions, or anything else at Showcase@CXPulp.com! Announcing… The Obligatory Everything But Imaginary! Well guys, it’s been about twelve minutes since I launched a new product, so it’s time, wouldn’t you say? I’ve been reading comic books since about 1985 or so. Since 2003, I’ve been writing about them over at CXPulp.com and various other places all over the internet. And now, because absolutely nobody is demanding it, I’m presenting my new series of collected features from the corners of the web, The Obligatory Everything But Imaginary. The idea is simple: every couple of months, I’m going to gather up five or six columns, essays or reviews from my somewhat vast archives that fit a chosen theme. I’ll do a little bit of editing, add some footnotes to give them necessary context and to inject a little additional commentary, and then put them in the e-book stores of the internet. The question, of course, was what to call this not-at-all-new series of columns. Taking a page from the great Bill Watterson, who chose the title The Essential Calvin and Hobbes for a book that collected two previously published books of comic strips which themselves had previously been published in newspapers (and was therefore not even remotely essential), I decided The Obligatory Everything But Imaginary had a nice ring to it. When a superhero dies, nobody thinks they’ll stay dead. When a superhero kills, everybody gets up in arms. When someone close to a superhero bites the bullet, no one knows what to think. 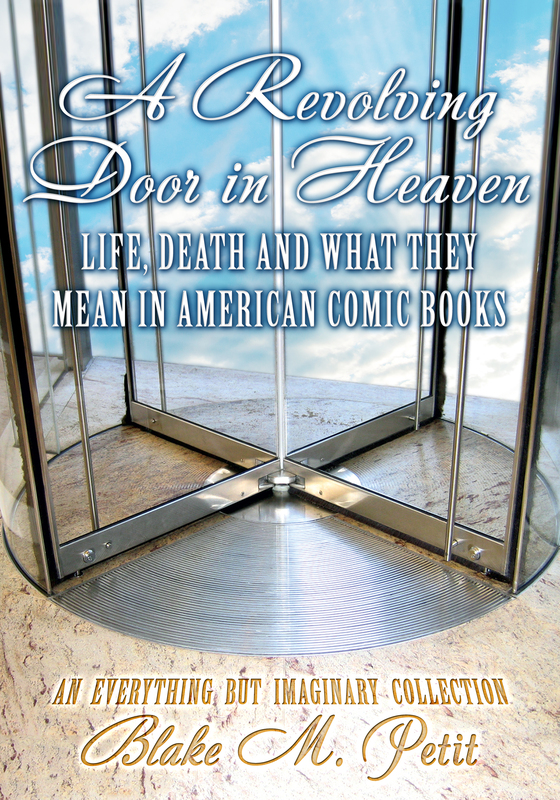 A REVOLVING DOOR IN HEAVEN is a series of handy essays about the phenomenon of death (and life) in mainstream American comic books. The Obligatory EBI is not a money-making proposition for me, it’s a name recognition thing, so I’m offering the volumes as cheap as I possibly can. In the Smashwords.com store, where you can get it in any format for whatever e-reader you happen to have, it’s a whopping zero cents. That’s right, absolutely free. In the Amazon store, you can’t set a book for free unless you meet some very specific criteria involving where the book appears digitally and exclusivity and sacrificing a Peruvian tree frog at midnight on the winter solstice… long story short, this book isn’t eligible. So I’ve set it at the lowest price Amazon will allow, 99 cents. But fingers crossed, Amazon will notice it’s free elsewhere and price-match… they do that sometimes. Anyway, however you want to get it, the book is available now. Check it out, tell your comic-lovin’ friends, and feel free to suggest topics for future volumes!